The idea behind Il Divo, who appear at the Brighton Centre, in June, was to form a multinational quartet of talented young singers to recreate the quality of Luciano Pavarotti, Jose Carreras and Placido Domingo. Il Divo have released eight albums in fifteen years and is made up of four singers, three of whom are classically trained, from four different countries. Q/ How is the new tour going so far? Urs Bühler: "We have started the first leg in Canada. It's a really beautiful show. I think it comes over great. We played castles and stately homes in the UK last July with our Timeless tour, which was based on the new album. "We played the whole repertoire, which was actually quite risky, but the album is very beautiful so it went down really well. This is more back-tobasics - the four of us singing. We still do a few songs from the Timeless album but we do all our greatest hits as well. "It's about 100 minute show, without an interval. The audience seem to like it so I'm very excited to bring it to the UK and play the arenas again." David Miller: "We started in Winnipeg where it was 20 degrees below zero Fahrenheit. We were bundled up that day for sure." Sebastien Izambard: "We decided to tweak the gig because it's our 15 year anniversary. What we realised was people really want to see just the four of us. We had dancers but now we're listening to what our audience wants with some of our best songs ever, and our latest album Timeless. Songs like Hello from Adele to John Legend All Of Me. In my opinion it's a really good show. We're having a really good time." Q/ Did you ever expect to be together for 15 years when you started out? Seb: "Never. It's hard enough to keep up a marriage, so imagine how it feels keeping a whole band together - especially when it was an arranged marriage. I still think sometimes: 'It's not real'. It's striking the amount of counties and cities we've been to. I find it amazing. "I know more where a lounge is than where the forks and the cutlery are at home. I lived in England for almost 10 years and it's always like coming back home." Q/ Why did you decide to strip it back this time? Urs: "When you go to concerts, I like to see shows with something happening on stage. We get excited and have lots of ideas - we could do this, we could do that. Then you play your show like this for a whole year all around the world. You ask people: 'What did you think about the video and the stage set?'. And they go: 'We just came to see you guys sing'. That's a comment we've always gotten. So you know what, let's strip all the fuss away and just make a beautiful concert. We enjoy that the most, and the audience enjoys that." Urs: "It"s not necessary so why bother. The Il Divo music is very beautiful. We have a few things up our sleeves which I'm not going to give away but it's a fun show." Q/ Narrowing down the Greatest Hits set list must have been a challenge. Urs: "It is, definitely. There are certain songs, which have to be in there. Obviously Unbreak My Heart and My Way. We've done Greatest Hits shows before but the repertoire was different. We do have a lot of songs and have done a lot of specials with other artists, like the football World Cup. It's all Greatest Hits. It is difficult. We get help from outside - we talk to management - and always size it down to a show length. "I've been listening back to the first albums and we've got such beautiful, original songs like I Believe In You, Isabel - which we're doing again - and other songs we do in the show. I'd be very excited to do a show with only original Il Divo songs. "We've done a lot of covers and people know these songs but I think we have a stunning original repertoire that would totally be worth doing a show around. Maybe something for the future - the original Greatest Hits." Q/ What is it like on your tour bus? Urs: "We're not travelling on a tour bus. I've done two north American tours on a tour bus but not with the other boys. They don't like that. Sebastian and Carlos get quite easily carsick. David would be OK.
"It becomes a financial thing. If you rent a whole tour bus it's very expensive unless you fill it up - they normally have 10 or 12 bunks or up to 18. If you don't fill it up it's going to be cheaper to fly the whole party around." Q/ What are your favourite memories of performing in the UK? Urs: "Last year the tour was absolutely spectacular. You might remember the weather we had in the UK in July. I'm big into medieval times and ancient properties. "Playing in front of Edinburgh Castle and these beautiful properties - house keeping would give us a private tour - that was wonderful. I enjoyed last year's tour so much. It was almost like I was going sightseeing in the UK and we only had to perform a show in the evening on the side. "The UK is where our career started - where we did the first record and had the first record company. It's where the audience embraced us from the beginning. It's like coming home when we come to the UK. "We play the Royal Albert Hall in London again, which I'm very much looking forward to. It's a beautiful venue. It's a very comfortable, homely, family feeling coming to the UK to play these shows." David: "I love the UK. It's one of my favourite places to spend time in. It's a compact area - we can drive from city to city or take the train. So much of what is challenging about our touring schedule is we spend almost every day on a plane as we're in a different city every day, sometimes a different country every day. There's no time to experience boots-on-the-ground of a country. "To be able to drive across the countryside and see and take it all in, even if we don't get to spend so much time in any of these cities, it feels like we"re taking more of it in. 15 years ago we started in the UK and we have such a great fan base. People show up to our concerts and they have a great time. They let their hair down, they let the music in and there"s no greater compliment to an artist than to feel received. That's what we really get from the UK." Q/ Which home comforts do you travel with? Urs: "Nothing really. I'm so used to travelling and spending nights in hotels I feel so comfortable in whatever bed I lay down, unless it's really bad quality and the pillows are bad. "That's really annoying. I take clothes with me - two suitcases for two months and I wish I could take 10 because I like my wardrobe. I have got my wife with me if that counts for home comforts? She"s travelling with me all year. We got married two and a half years ago under the premise that we're going to spend our life together and not that we're going to be married and I'm going to be gone 10 months out of the year. She's always with me and we go through all these adventures together. Home is where my heart is and that"s right next to me." 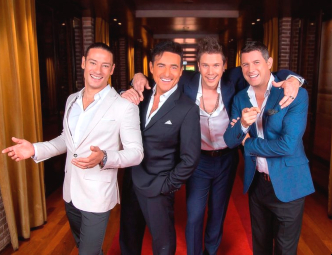 Q/ What's next for Il Divo after the tour? Seb: "We are working on our next album, which is definitely a repertoire that I didn't expect we were going to do. That was suggested by our management, Red Light. "We are definitely going to work on something, which is what people wouldn't expect us to do. That to me is really exciting because I don"t like to do the same thing. "That's why I did a solo record last year. I'm excited. I know it's going to be challenging on our voices what we're recording but I'm excited to bring it to our audience. I think that's very important otherwise our fans get bored. We get bored. Il Divo play The Brighton Centre on Thursday 20th June 2019. For tickets CLICK HERE.